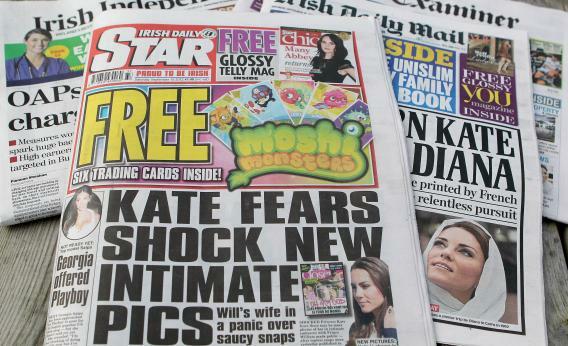 Irish newspapers claim links to their articles are copyright violations, demand $400. Irish newspapers like the Daily Star don’t want anyone linking to their hard-hitting original journalism. I’m not sure that I have ever had occasion to link to an article in the Irish Times, the Irish Independent, or the Irish Daily Star. But if those newspapers and others in a national newspaper trade group have their way, I will have to pay them $400 if I ever do. Otherwise they could sue Slate for copyright infringement. That’s the bizarre, almost unbelievable takeaway from an op-ed by an outraged Irish lawyer in the Irish news website TheJournal.ie, who argues the newspaper group is essentially “seeking to outlaw the free exchange of ideas.“ He notes that the newspapers aren’t just seeking to crack down on sites that summarize or excerpt their articles. Their position is that publishing a hyperlink alone constitutes a violation of their copyright and is illegal without prior consent and payment. If it sounds implausible that the newspaper industry could actually have adopted such a self-defeating stance, a statement published on the trade group’s website on Friday seems to affirm the lawyer’s claims. In short, National Newspapers of Ireland—which also represents UK-based papers such as the Daily Mirror and the Sun—is lobbying the government not to adopt any changes to copyright law that would make it clear that a link alone is not a copyright violation. “Our view of existing legislation is that the display and transmission of links does constitute an infringement of copyright,” the group writes. That’s in keeping with the position it first outlined in an official letter it wrote to the governmental copyright review committee in July. This isn’t just abstract legal theory. According to the outraged lawyer, Simon McGarr, Irish newspapers have in fact been badgering Irish organizations that link to their sites with letters, emails, and phone calls demanding payment. McGarr says the newspapers are charging €300, or nearly $400, for the right to link just once to an article on an Irish newspaper website, with prices rising to €1,350 for more than 25 links. They’ve apparently gone so far as to hound an Irish charity called Women’s Aid for linking to positive news stories about their fundraising efforts. I’ve emailed the newspaper group for further explanation of its stance, and will stand by to see if its lawyers try to charge me $400 for the link to their website that I included above. That means I can now link to the Irish Times, at least, without fear. Let’s just hope my brief summary of their article doesn’t cross the line.